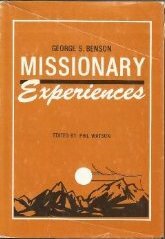 These two books, written by my great-grandparents, offer unique perspectives into missionary life in the early 1900s. The first book, written by Dr. George S. Benson, covers their move to China, his role in founding Canton English College in 1932, missionary experiences in the Philippines, Korea, and Zambia, as well as stories from his service as president of Harding University in Searcy, Arkansas. The second book reads like a letter home. It gives insight into the heart of a woman who sacrificed much, but who gave heart and soul in the service of her God. I did not know this book existed until 2013, but I am so grateful for the discovery. Simply click on the links below to open the pdf files, or right-click and save to your computer. A few folks have contacted me, complaining that the pages are sideways. Although the pdf files might open sideways, you should be able to change the page orientation within your pdf reader. And although my grandparents on my dad’s side never wrote books, I’m still very much blessed by their godly legacy. My grandfather took many (like more than 20) short-term trips to India, and my grandmother did a slam-dunk job raising four boys. Click Here to read some of my grandmother’s recollections from days past. We received a copy of this as a FOL donation, library bound in hard plastic and are unsure what to do with it. It seems too unique to put in our dollar sale. Do you know if there is interest out there? Can’t find a value. Hey there, Chris! You might want to check with the Harding University library in Searcy, Arkansas. I think they might be very interested. Thanks! I was born and raised in Hong Kong. I have always been interested in church history. I interviewed Dr Benson in 1986 or 1987. It’s amazing that he could still talk a bit in Cantonese. Thank you so much for the link! I look forward to checking it out! — Jonathan T.